The “Grizzly” group v The Forest Half! 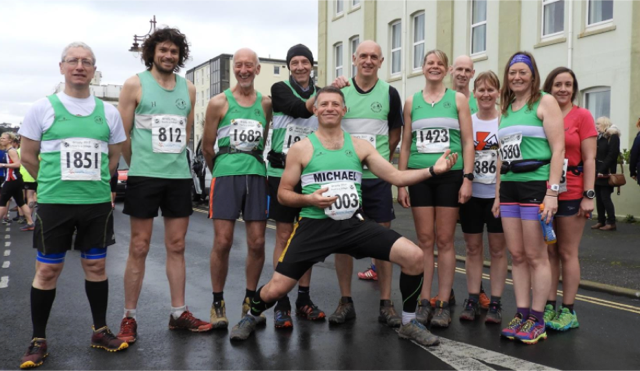 Twelve Forest of Dean runners took part in the annual ‘Grizzly’ race on Sunday the 12th of March, a race which takes place around Seaton in Devon each year and is known for being one of the toughest twenty mile races in the country. It involves running along a shingle beach, through bogs and includes over 1000 meters climbing in the local hills. The race attracted over 1800 runners this year with entrants coming from throughout Europe and as far away as the United States. 53 runners travelled from the Netherlands possibly to enjoy the experience of running on hills. First FODAC woman home was Helen Lipscomb in 3:45:10 followed by Kate Burke in 3:55:05 with Gemma Hewitt and Jo Edwards crossing the line together in 4:23:30. Gemma had completed the 45 mile Green Man circumnavigation of Bristol the weekend before and took on one of the toughest UK races when most of us would have been resting. Mark Channer and Karen Barnett also managed to complete the course, in Karen’s case, despite a heavy fall on route. An record 54 FODAC athletes joined a total of 2253 runners in the Forest of Dean Spring Half Marathon this Sunday with some taking top positions at the finish line. Included among the star performers this year were Mother and son duo, Catherine Roberts and Alex Lindfield with Catherine taking the prize for first woman forester home with a finish time of 1:37:14 while not to be outdone, Alex took the prize for first male forester home with a very impressive of time of 1:18:36. Catherine finished 2nd in the F45 category out of 143 a mere 6 ½ seconds behind the first placed finisher Lou Summers of Pontypool District AC while Alex took 5th place overall in the race and 4th place in the men’s senior class out of 508 placing him well within the top 1% for his age group. The 2nd male FODAC runner back was Steven Richards with a time of 1:23:35 which placed him 6th out of 423 in the MV40 class while John Hamilton took 25th place in the overall race with a time of 1:23:58. The 2nd female FODAC runner was Melinda Ruck in 1:43:43 which placed her in 5th position among the 143 in the F45 class while Martha Hamilton finished in a very credible 1:45:12.